With a solid defensive display against Stoke last week, Liverpool’s Mignolet (5.0) is our man between the sticks this time, as they take on newly promoted Bournemouth at home. But consider this a short term investment, as their next few fixtures get extremely tricky, with trips to London and Manchester on the cards. Alternatives: Swansea’s Fabianski (5.0) is our alternative keeper for the week, as they take on Newcastle at home. Attacking full backs Clyne (5.5) and Darmian (5.6) have caught our attention after some good displays in the last gameweek. Both of them have shown a tendency to make good marauding runs forward, and could very well chip in with an assist, as they take on relatively easy teams this week, in Bournemouth and Aston Villa. 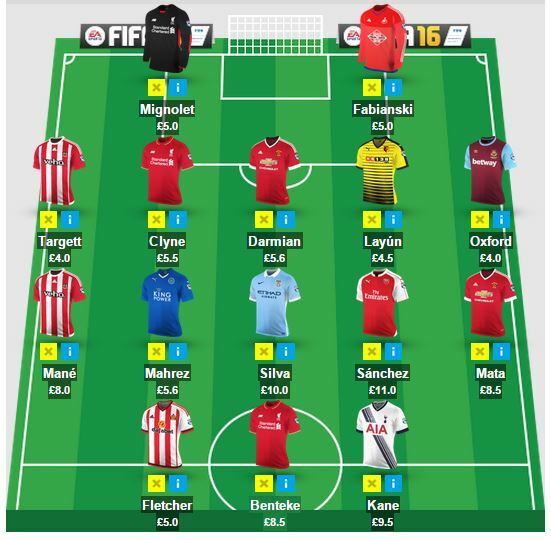 Next up, Southampton’s Targett (4.0) and Oxford (4.0) lead our budget friendly contingent this week. The talented youngsters have shown that they can very well punch above their weight and are guaranteed starters for their respective teams. With Bertrand set to miss atleast 2-3 weeks more, Targett is nailed on at the right back slot for a while, with a favourable set of fixtures till GW6. Finally, Watford’s goal scoring defender Layun (4.5) is our last pick in defence, as they take on West Brom at home. Alternatives: Liverpool’s budget friendly Gomez (4.6) is an excellent alternative option if you’re cash strapped. Also consider Spurs’ Davies (4.5) who will face off against Stoke at home. Leicester’s Mahrez (5.6) has been in absolutely blistering form since pre season, and carried over that form right into the league with a brace in his first gameweek. The budget friendly midfielder has already seen his price get hiked up by 0.1m, as fantasy managers gear up for their favourable run of fixtures until GW7. Mane (8.0), Sanchez (11.0) and Mata (8.5) are our next three picks in midfield. In spite of all three failing to rack up points in GW1, we’ve got immense faith in them to make an impact this week as they take on relatively easier opposition. Arsenal sorely missed their main man last week and will be looking to bounce back from a horrible start, with Alexis leading the charge. Also, expect Mane and Mata to pick up an assist or two this week as they take on Everton and Villa this week. Our last pick in midfield is City’s silky playmaker Silva (10.0). In spite of Yaya Toure stealing the show last week, we’re going with Silva as we feel with Aguero back in the mix, and Sterling for support, Silva is going to reap some good points over the next couple of weeks. Alternatives: Hazard (11.5) failed to make an impact last week, but is still a force to reckon with, as they take on City at the Etihad. An excellent alternative to consider this week is Swansea’s summer signing Ayew (7.0), who scored in his debut match last week and picked up maximum bonus points along the way. Kane (9.5) and Benteke (8.5) are our top two picks to lead the line this gameweek. Though both couldn’t get on the scoresheet last week, they had some good shots on goal and look most likely to rack up points this week as they take on Stoke and Bournemouth at home. Sunderland’s Fletcher (5.0) is our final pick, as they take on a Norwich side who shipped 3 goals against Palace in GW1. Fletcher netted his first goal of the season last week, and will be looking to cause all sorts of trouble to the Norwich back four on Saturday. Alternatives: Swansea’s Gomis (7.0) and Southampton’s Pelle (8.0) are two decent options to consider this week. Also having Rooney (10.5) in your team wouldn’t seem like such a bad idea, as they face off against Villa on the road. This entry was posted in General, Squad and tagged EPL, Fantasy Football, fantasy premier league, Fantasy Squad, Fantasy transfers, FPL, gameweek 2, gw2. Bookmark the permalink.